A little while ago I blogged on the subject of Islam and the modern world, following the BBC series on Mohammed. This included some rather dismissive comments about Christianity, which I contrasted with Islam in some rather unfavourable ways, at least with regard to consistency. Unsurprisingly this annoyed a (Catholic) Christian reader, and we subsequently engaged in a prolonged Twitter conversation, mainly about the crusades. Twitter isn’t a good medium to explain ideas, and I feel strangely compelled to explain myself properly, even though I am not going to persuade anybody to change their views. 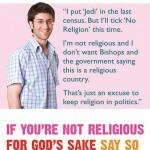 My point is this: I hold my views on Christianity not through ignorance but through a lack of faith. This has led me to rather a long post, taking me through my own Christian journey. Faith is an important part of any religion – and any relationship in fact. To be a Christian you have to subscribe to a whole series of beliefs which you take on trust. It’s your membership subscription, or, more aptly, the club rules. You believe these things because you are a Christian; you not a Christian because you believe in them. Or mostly, anyway. People will be drawn to the faith because they come to believe, through reflection or experience, in some critical parts of Christian gospel; they then take the rest on trust. For me I was drawn to the faith in the first place because I believed in my church community and wanted to be part of it; subsequently I was overwhelmed by the truth and beauty of the message of love, forgiveness and redemption that came through in the Gospels and the early Epistles of St Paul. I lapsed mainly because the burden of faith became too much to bear – the accumulated superstructure of doctrine. In my heart of hearts I could not believe that God is a person who intervenes in the world beyond the workings of immutable natural laws; neither can I believe in any meaningful afterlife, certainly in the sense of heaven, hell, judgement and so forth. But I am a secular agnostic, not an atheist. I am sometimes moved to take Communion in a C of E church service, on the rare occasions that I attend. It is not inconceivable that I will come back to the faith one day, provided I’m not pushed too hard on the infrastructure of beliefs. 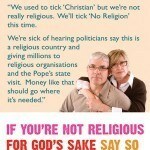 I was brought up as a Church of England Christian. Both my parents had a strong faith, and took a philosophical interest in it and we talked about Christianity a lot as a family. My mother’s father was a canon and professor of divinity (at Oxford), though he died long before I came into the world. Our house was full of religious books, and my mother, who had a degree in Philosophy, studied theology and comparative religion as a mature student. Our church was rather High, in the jargon of the C of E, meaning that it liked a lot of traditional, catholic rituals. The biggest controversy at the time (it was the 1970s) was whether women could be ordained to the priesthood – my parents strongly beleived they could, but some of our clergy did not. At university (Cambridge) I fell in with a much more “Low” group in the Christian Union, associating with Methodists and Baptists. Here the issues were mainly about how to interpret the Bible, with a strong fundamentalist faction. I had something of an intense religious experience while meditating in a retreat, as the message of love seemed to explode out of the New Testament in a burst of light. That experience remains with me still, but I started to lapse pretty much as soon as I began to live on my own in London. And so my views of on Christianity became very detached, as I was liberated from the eye of faith. I have come to see it as a very interesting human phenomenon, and not a process of divine intervention. It is an outgrowth from the Jewish faith, promulgated by a few years of radical and inspring preaching by Jesus Christ. Something strange happened on Jesus’s death; his followers became inspired to accept Jesus himself as divine, and to spread the religion further. There were several strands to this outgrowth, but the most important to us in the west was that of St Paul, who took the message to the Gentiles. The faith was the right idea at the right time and its popularity exploded. It survived persecution, with its adherents apparently welcoming martyrdom. But then it was adopted as a state religion by the Roman empire. This was a major challenge. Christianity was at heart a revolutionary creed, with some burning beliefs but with a certain lack of coherence. Some of its beliefs, especially a very strong strand of pacificism, were inimical to running a state. Gradually it had to be knocked into shape, and a series of doctrines were established to create an orthodoxy compatible with a state religion, starting with that of the Trinity. In due course the great thinkers of St Augustine of Hippo and St Thomas Aquinas added to this process to create a coherent framework of doctrine. This has subsequently been added to and taken away from both by the orthodox branches and various breakaways – the latter often trying to recapture the early Christian magic from the dead hand of the orthodox (that is Catholic and Orthodox) institutions. These doctrinal systems may or may not be quite tidy, but they really do need the eye of faith to make them work, and the more so as time passes. They are simply part of a process of divine revelation. But without faith they just look awkward. This awkwardness has two roots. The first are the compromises required to get the cat back into the bag. Monotheism is one of the most conspicuous casualties here. The divinity of Christ was an early theological problem, and the Holy Spirit crept in too. To this pantheon has been added the Blessed Virgin Mary and countless saints, to whom many Christians pray. Of course Christian theologians offer a reconciliation of this pantheon to monotheism, but these sound very similar to any other defence of polytheism. The contrast with Judaism and especially Islam is quite striking – though some Islamic sects (notably Shias) have blurred the difference by consecrating saints. A further difficulty is that the doctrinal view is increasingly at odds with modern beliefs about the universe. On my kitchen wall hangs a facsimile of the Mappa Mundi, the early medieval map in Hereford Cathedral. The world is a flat disc, with Britain at the edge and Jerusalem at the centre. Such a world view was quite compatible with the idea of God being a person, a bit like us, inhabiting a nearby world, and intervening in our affairs. We can begin, perhaps, to understand the idea of Atonement, that “God so loved the World that he gave his only Son to be a living sacrifice”, which comes through from the very earliest Christian writings. But now we understand the universe as being vast, which leaves this idea with a problem: either God is much bigger and more powerful than we thought in which case the idea of the son of god, and sacrifice, and indeed the whole concept of God as a person is impossible to get a handle on. Or else God is much smaller than that, like The Authority in Philip Pullman’s His Dark Materials, in which case it becomes impossible to offer him the respect the religion demands. And the Crusades? I am rather shocked that any modern Christians seek to defend them. The intent, apparently was to protect and liberate Christians in Jerusalem (and elsewhere, for that matter). This might be argued as an extension of self-defence. But they have become associated with the slaughter of infidels, and many other crimes (such as the sack of perfectly Christian Constantinople). These may or may not have been part of the intent, but it is quite futile to separate the “justifiable” bits from the crimes. Christians do not do that sort of thing now – and Christian communities remain under attack in many parts of the world. Violence begets violence; early Christians turned the other cheek. It has allowed Muslims to convince themselves Christianity is something that it is not. If you’re in a hole, stop digging. Best to put it all down to a horrible mistake, based on values that we have long left behind. Compared to Islam, Christianity is a chaotic muddle of a religion. But in that muddle there remains a burning light, which the muddle, paradoxically, seems to magnify rather than diminish – that light burns more brightly for me than any equivalent understanding in the faith of Islam. The British Humanist Association has been urging people to tick the box for “No religion” if they are not practising members of a faith, rather than tick “Christian” if they are merely baptised, or write in “Jedi Knight” as a general wind-up. As I will explain, I agree. But the main heat arises from the BHA’s advertising campaign; following a ruling from part of the Advertising Standards Agency that some people might take offence at the ads, and they have been banned from railway stations as a result (although some buses have carried them). This has generated lots of media coverage, which may have been the original idea, but I still find the whole episode very annoying. The three ads are posted below. But first, how to answer the question? I am an agnostic, as I have already explained on this blog. I am a confirmed member of the Church of England, but I don’t belong to a church. I am not an atheist. But I refuse to call myself a Christian either. When I was a practising, I did not approve of people who did not commit to the faith, but still called themselves Christians. 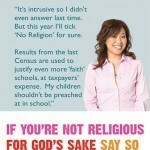 I am happy with the label of “no religion” however, and so it won’t be difficult for me to answer the question. Unlike the NHS job application form, which asks applicants to choose between various faiths and “atheist”; I have to tick “won’t say”, even though I am quite public about my religious status. So far, so good. But what does annoy me is that so much of officialdom treats people like me as a lower form of life. They protect Christians and others from even quite mild offence, but we don’t count. This is actually quite offensive. Fine. There is no liberal principle that people should be protected from being offended, and accordingly I put up with it: the BBC not allowing humanist speakers on Thought for the Day; the Pope implying that I don’t have any moral values because I don’t believe in God; women wearing the niqab because I can’t be trusted to look at their face. But it annoys me that we have to mollycoddle people of faith against being similarly offended. Suddenly ticking the “No religion” box feels like an important assertion of my identity, rather than a simple statement of fact. Nowquestion 15, “How would you describe your national identity?” is something else. I think I’m going to write in “European” alongside British and English. Earlier this month BBC4 ran a documentary “The Secret Life of Waves”, by documentary-maker David Malone. Apart from explaining the usual stuff about ocean waves, he went off into to a philosophical and spiritual dimension, comparing waves to life itself. I found this very moving. It was also nice to see that non-religious professionals are allowed to offer profound thoughts on spiritual matters. Normally as soon as you mention “spiritual”, assorted religious types start to gather like vultures around a carcass, all too often offering no more than empty dogma. Radio 4’s Thought for the Day doesn’t allow non-religious speakers. When a wave breaks it disappears, but the water that carried it remains. The wave has a life – a beginning, a middle and an end, but no substance of itself. It is a manifestation of “energy”, although I find that an unhelpful word. This is all we really need to know about our own lives. The idea of an afterlife doesn’t really survive serious reflection. Mr Malone shows this by pointing out that our concept of heaven – an essentially static place – isn’t at all attractive. I was brought up a Christian, but the idea of heaven and hell never convinced me. And I have found the idea of a God that intervenes in response to prayer, or sin or anything else, impossible too. I accept the scientific view of the universe, of its vastness and of our own origins through evolution. No heaven and hell; no divine intervention; no personal God. Christianity was built on these ideas. Without them the wave starts to break, just as an ocean wave breaks as it enters shallow water. So why am I not an atheist? I mainly think and act like one, long since having abandoned membership of a church. Well in the first place I associate atheism with a hard, evidence-based view of the world. This world has no room for mystery, as my brother Richard Green points out. It is of the nature of scientific evidence that there can only be enough to cover a small fraction of what we experience; do we simply pretend not to see the world beyond evidence? Atheists mock God as an “imaginary friend”, and yet their world requires quantities of a sort of negative imagination. And the religious insights that attracted me to Christianity remain a powerful influence on me today. I still cannot think of the Sermon on the Mount without excitement – it’s a flame that still burns bright – to invoke another transitory phenomenon. It is a crazy, defiant creed that tells you to renounce worldly wealth, turn the other cheek, accept humiliation and not be bound by the letter of the law but by its spirit. And there is so much more – it angers me that so many Christians seem to ignore what I see as the essence of Christian teaching. And finally there is the wave of religious experience itself. It is quite something to stand in an ancient Church and feel continuity with it – or to read ancient scriptures after so many generations before have done so. It gives a sense of belonging. The wave may be breaking, but I can’t quite renounce it.